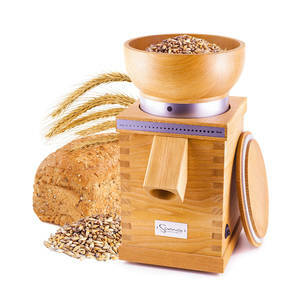 Beautiful and top quality grain mill made in Germany from natural beech wood. A combination of beautiful design and perfect functionality, the Sana Grain Mill is something you won't want to hide away in a cabinet. 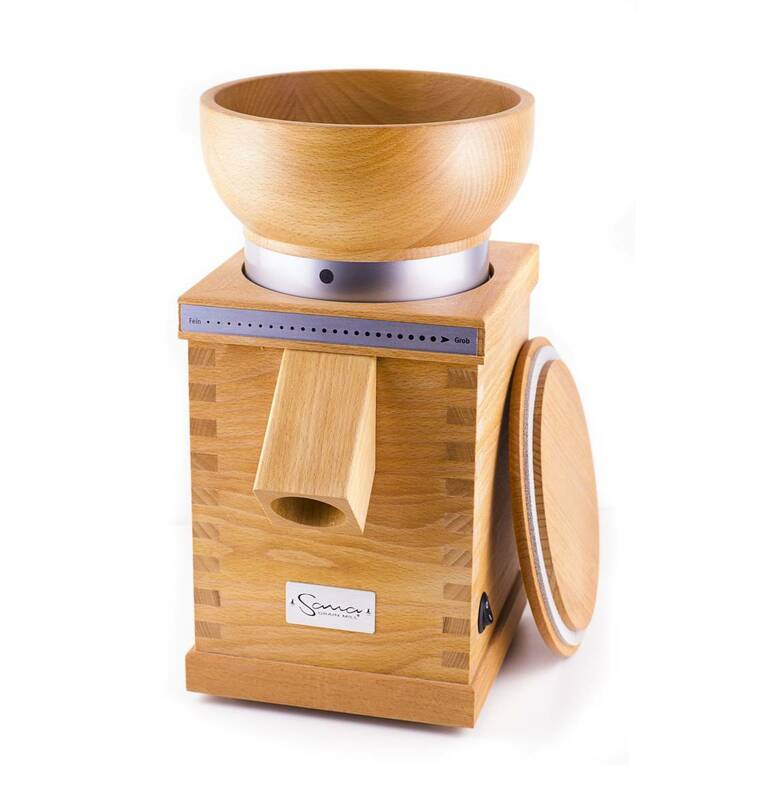 Encased in a solid beechwood cabinet is a powerful set of rotating stones that quickly grinds grain to fresh flour. 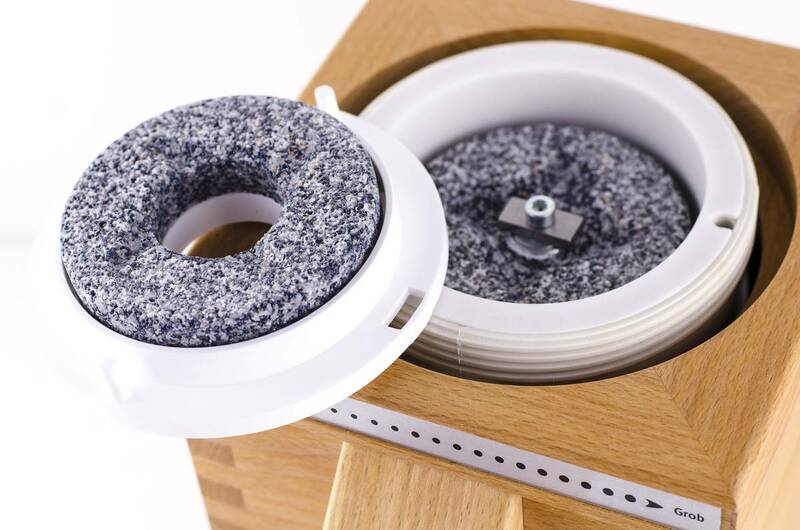 With the Sana Grain Mill, you can make fresh flour right before baking and be sure your flour is all natural with no preservatives or additives. You will taste the difference in the first loaf of bread you bake. 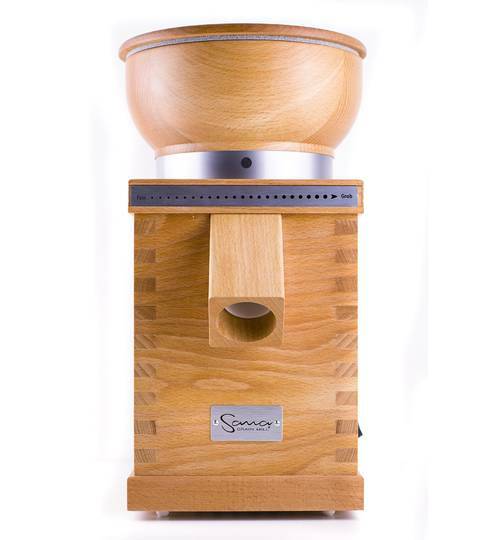 The Sana Grain Mill is exceptionally easy to operate. 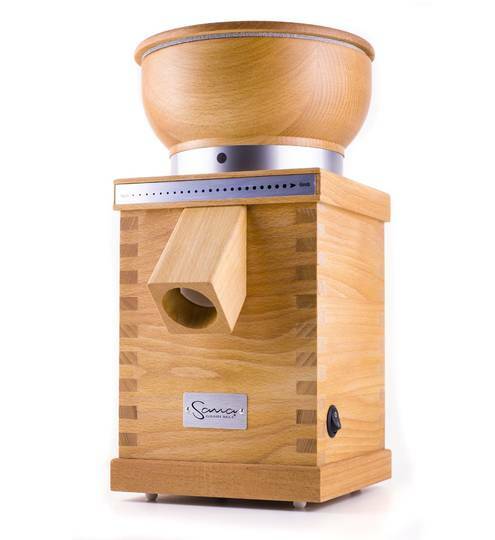 Just turn the machine on and pour grain into the large 850-gram capacity solid wood hopper. Rotating the hopper adjusts the texture of the flour. You can make anything from cracked grains and coarse meal to extra-fine cake flour. With its fast 100 gram per minute output, you'll have the fresh flour you need in moments. And cleanup is exceptionally simple. Just unscrew the hopper and brush off the stones from time to time, or run some rice or wheat through the mill. The Sana Grain Mill uses two 85 mm millstones made from a state-of-the-art composite of ceramic and corundum. These millstones have an extremely rough surface, which hardly wears down at all after years of use. They grind coarse grain quickly into fine flour, and are practically indestructible. 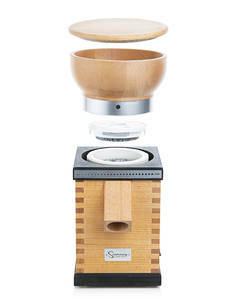 Because the Sana Grain Mill is designed to last a lifetime, it should look good sitting on a kitchen counter. That's why the housing of the Sana Grain Mill is made from beech wood harvested from environmentally managed forests. The solid wood construction with finger-jointed corners reflects the wholesome goodness of the grains it processes. Red and white wheat, Oat groats, Rice, Spelt, Barley, Buckwheat, Rye, Millet, Quinoa, Field corn, Dry lentils, Dried beans, Dried spices etc. Full insert set includes upper and lower milling stones and silicon liner. For 350 watt mills. I´m very happy with Sana mill. 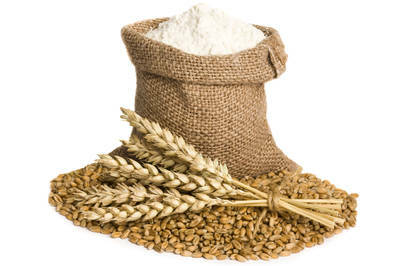 Finally I can prepare really fresh flour and bake traditional home bread. Do you make mills that operate at 110V 60HZ? I'm sorry, but our grain mills are just designed to operate at European voltages. However, similar mills can be purchased in the USA which operate at 110 V 60HZ. i've ordered it,but it's out of stock.how long do I have to wait for it? A beautiful and natural way to let rise 1 kg bread. Wood and plexiglass grain storage unit. 13 kg capacity. Wood and plexiglass grain storage unit. 9 kg capacity. A practical way to store grains, legumes, and pasta. Store grains beautifully in this larch wood home grain silo. 5 kg capacity.